The latest book from Rian Hughes is a thick one at 576-pages. 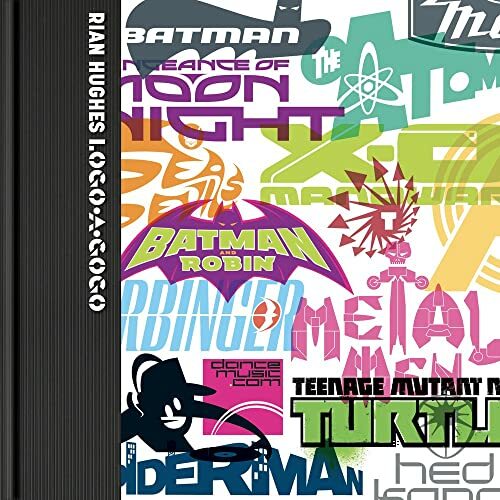 Rian Hughes is a prolific author whose books focuses mostly on art and graphic design. Logo-a-gogo: Branding Pop Culture is a book the features logo designs for pop culture brands. You'll get to see examples of logos created for music studios, albums, comic books, T-shirts, magazines, bands and more. There's actually quite a lot of comic-related logos, such as those created for various titles from DC and Marvel. Each logo has some text talking about the design and a brief background. What I like about the book is not only are there iterations of the logo designs, but you also get to see the logos being used on the various media it was created for, such as on books as cover design, T-shirts and products. That really gives you an idea of how the logos look like on a physical product. I've seen some of the comic title logos before but not the unpublished ones of course. So it's interesting to see the other versions that were created but not used. These pop culture logos are fun and some have playful designs. They are very different from corporate logos in terms of look and feel. For graphic designs, this is a good reference to get to expand the variety of logos you can refer to for ideas. There are 576 pages of logos in one convenient package here. So yeah, it's worth the money. Availability date: Amazon UK from 2 April 2018, and on Amazon.com 1 July 2018.